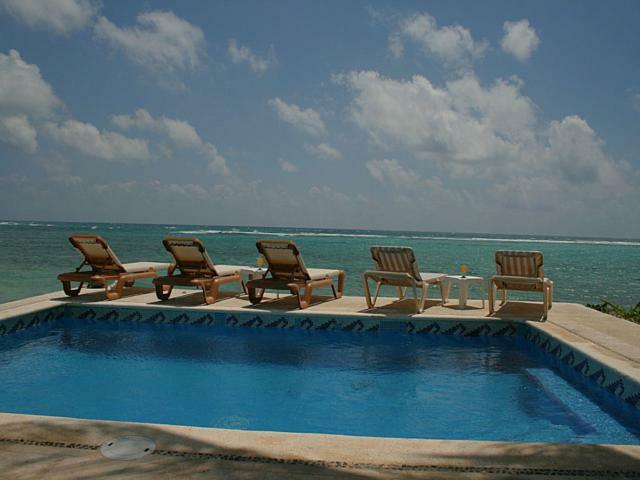 Villa Turquesa is a deluxe villa located on the beautiful white sand beach of South Akumal. 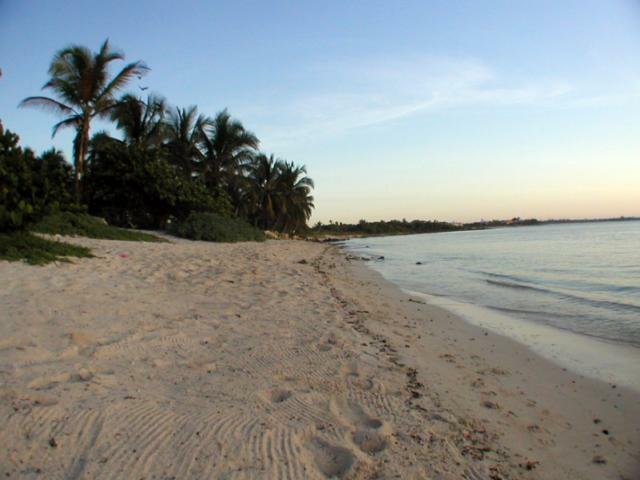 This quiet, residential, beachfront neighborhood is located just 60 miles south of the Cancun Airport and only 1.5 miles south of North Akumal. Sleeps up to 20 adults and 4 children. 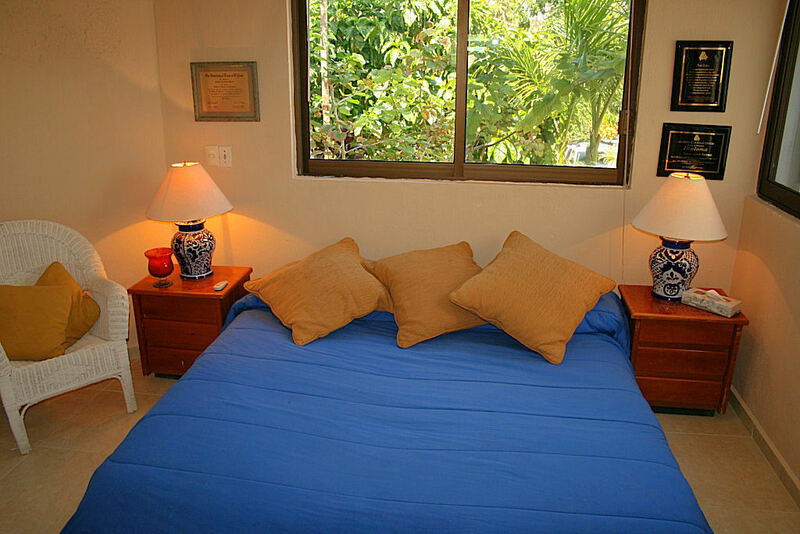 Upon entering this quaint, gated community, Villa Turquesa is the very first home you come to and will be found tucked away amongst breathtaking tropical surroundings. A lovely front garden with an assortment of lush, tropical foliage leads you to the villa's front entrance. 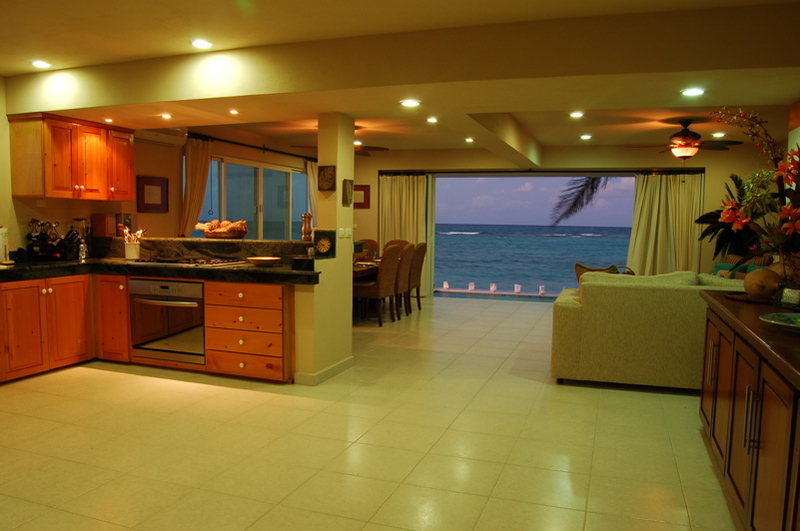 Walking through the front door to this gorgeous villa, your first sight through the living area will be an unforgettable view of the sparkling turquoise waters of the Caribbean ocean through enormous sliding glass doors! These glass doors open the full width of the villa so you are sure to always have the most spectacular views wherever you decide to relax. 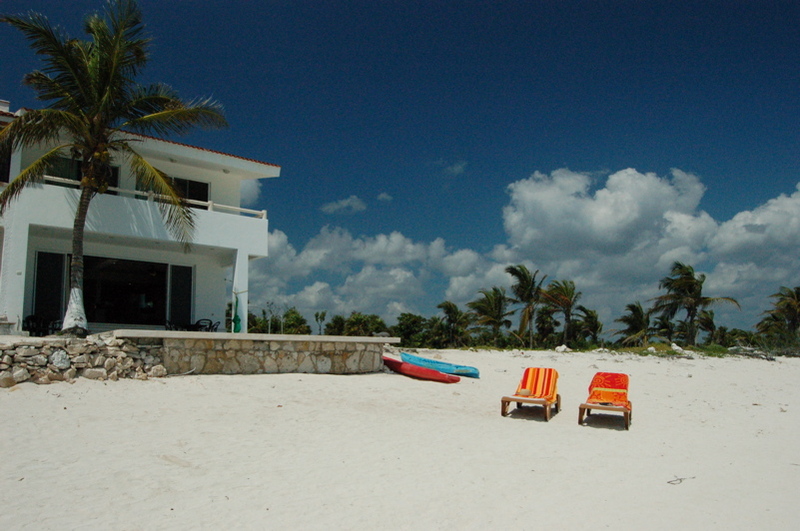 The white sand beach in front of this gorgeous villa is open and inviting. 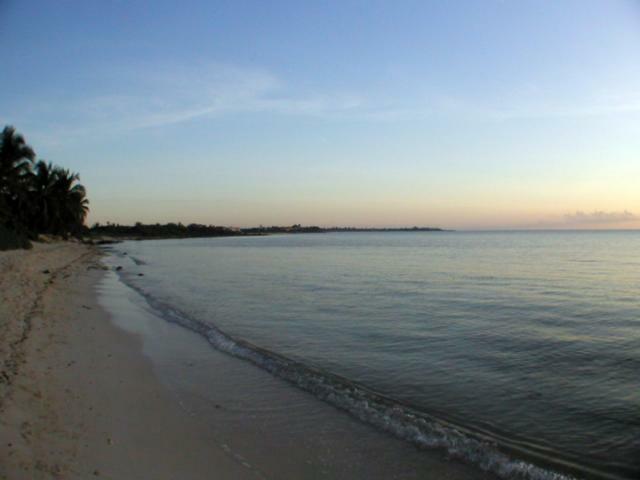 Find yourself strolling along this unforgettable shoreline with easy access to the crystal clear ocean in front of you and an expansive, undeveloped jungle lot to one side, which will ensure privacy. It is the perfect place to relax in chaise-lounges while the kids splash around in the refreshing waters of the villa's pool, which overlooks this exclusive beach setting. Just as magnificent as these surroundings and picturesque views are from the exterior, the same holds true for the interior of Villa Turquesa. 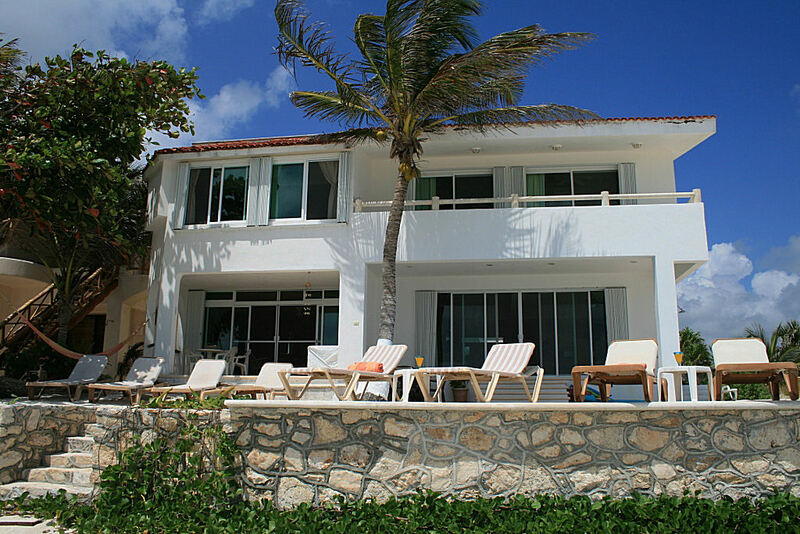 Villa Turquesa consists of a 3500 square foot Main House and 3-bedrooms on the 2nd level (Guest Level) that can be added for larger groups. 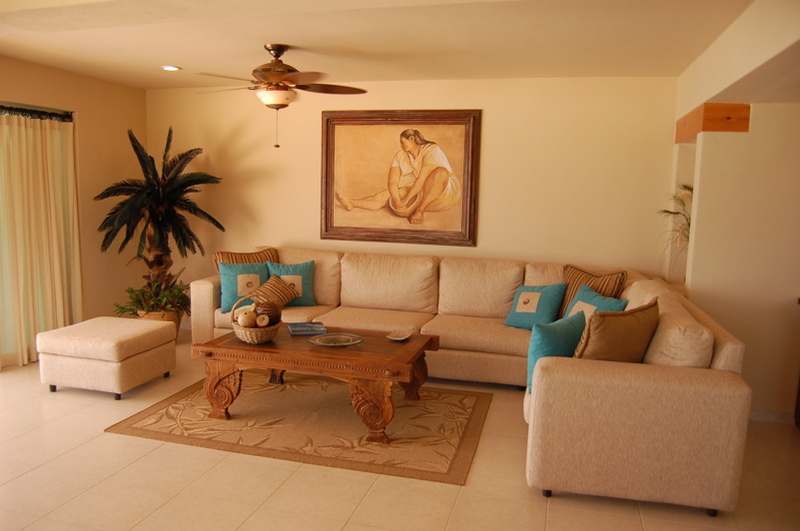 The home offers an open floor plan and plenty of luxurious living space. 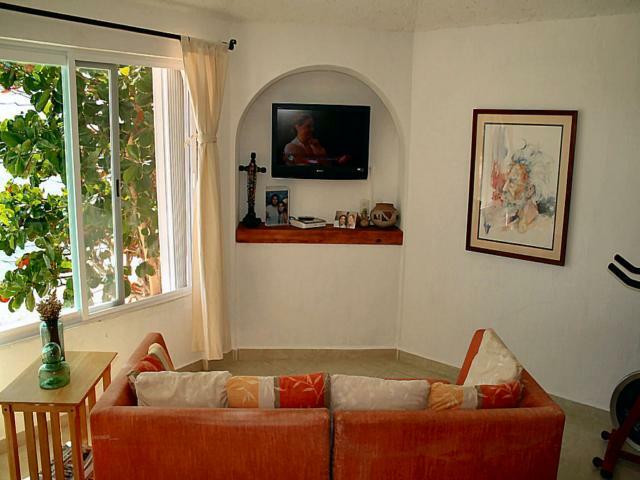 The living room boasts a sofa suitable for eight as well as satellite TV and DVD player. 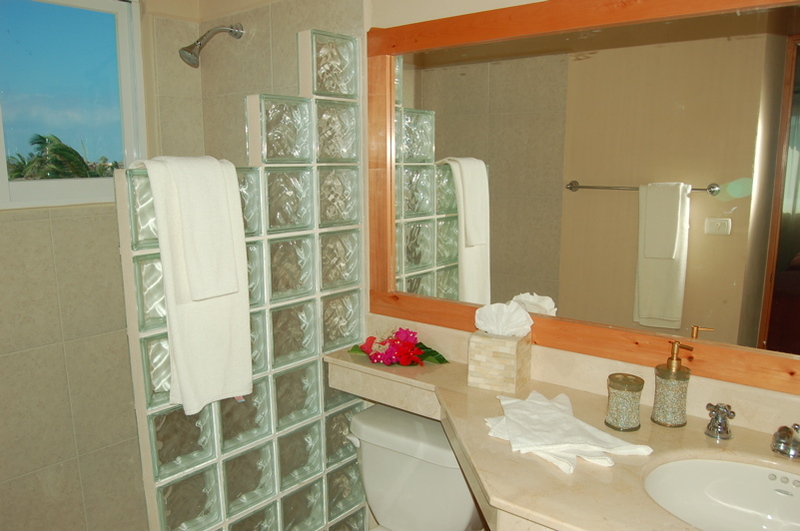 The kitchen is large and fully equipped with modern appliances. 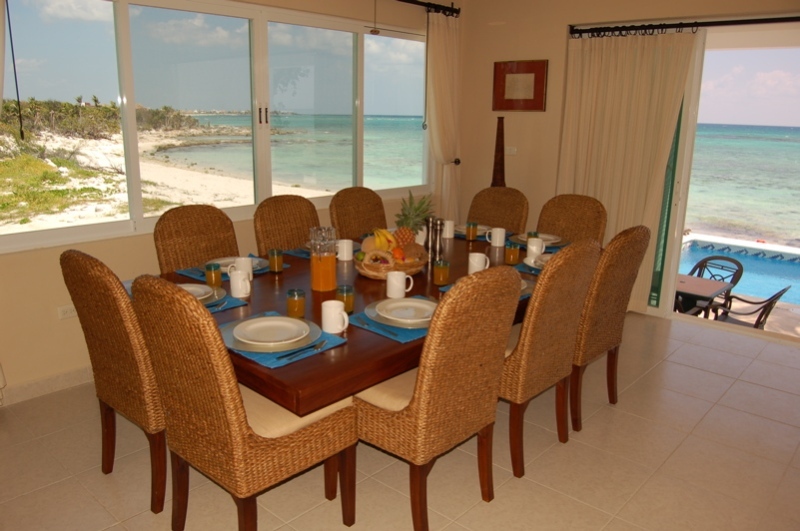 You can choose to create your own meals or have the cook come in and prepare scrumptious dishes for you in the lavish surroundings of your very own villa! 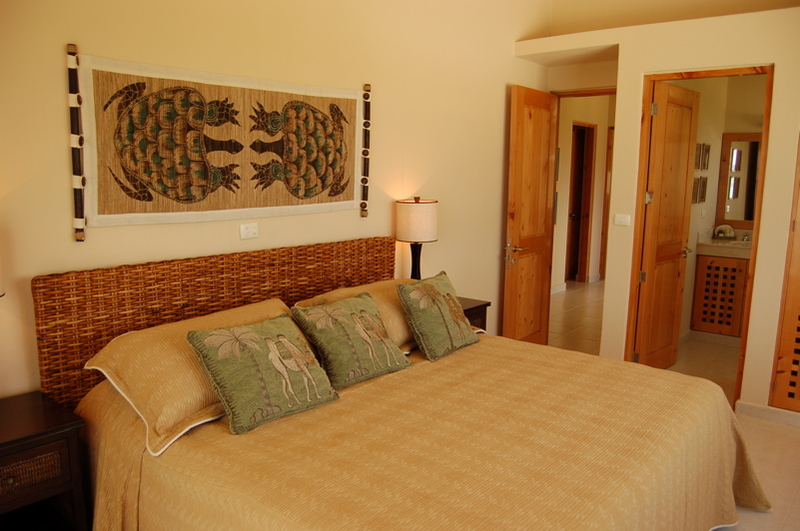 In the Main House, a cozy guest bedroom with two double size beds is located on the first floor down the hallway. 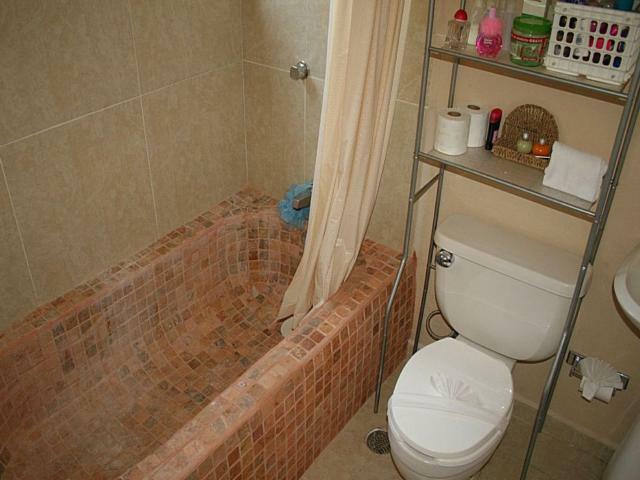 It has its own full bath and lovely garden views. 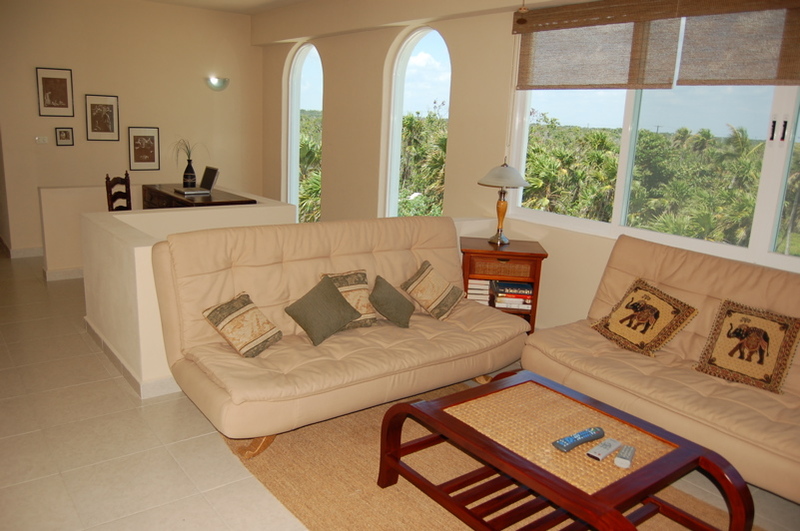 Returning towards the front door and climbing the stairs, you come to the warm and sunny studio which offers two couches, another satellite TV with DVD player and stunning views of the ocean and lush, green jungle. 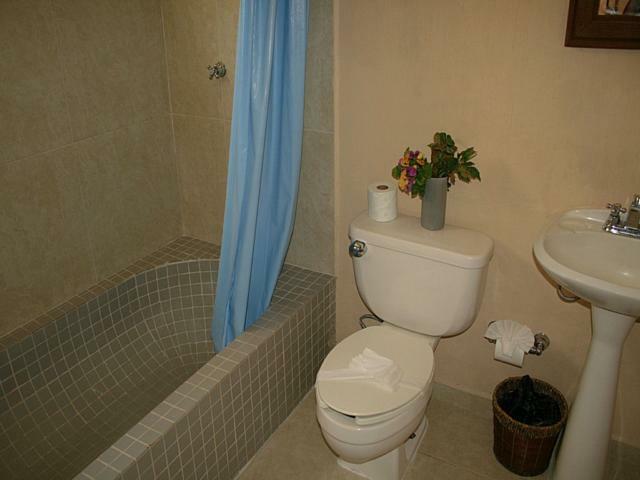 This studio, which is also the second entertainment area, has its own full bath and a lovely little nook complete with a desk, chair and wireless internet connection. 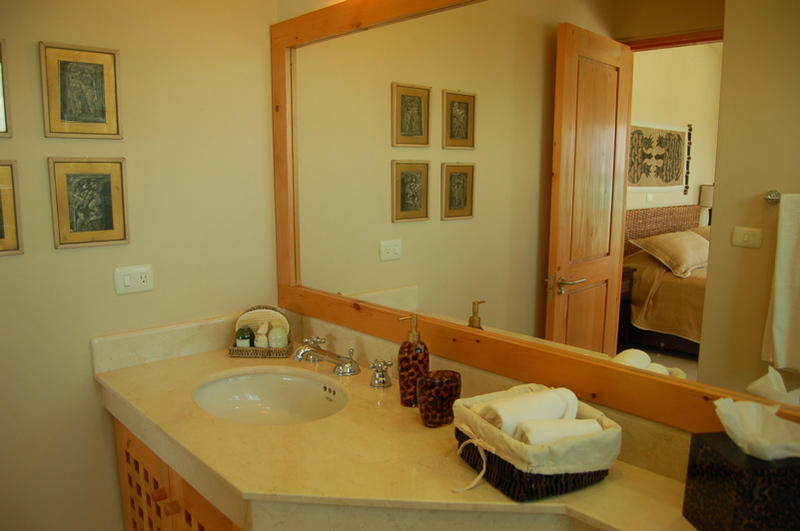 There are three bedrooms located on the 2nd level, each with its own luxurious bathroom and all with stand up showers. 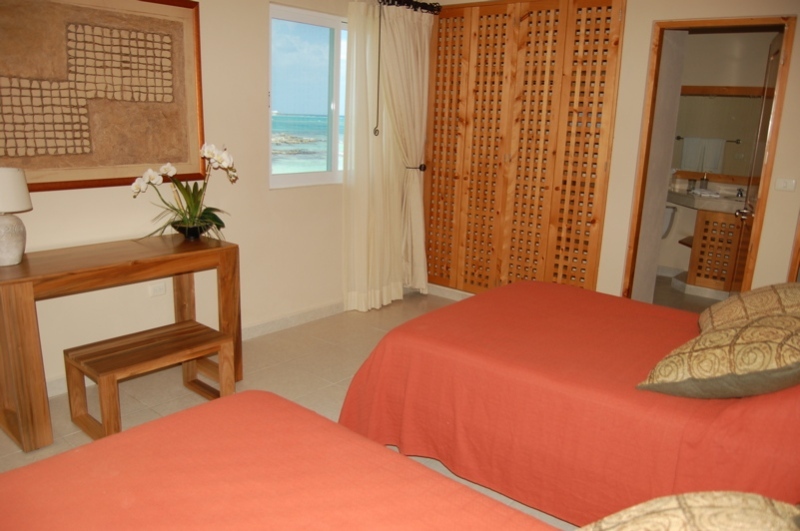 The first bedroom is the deluxe master bedroom with one king bed and a big balcony with fabulous views overlooking the majestic Caribbean. 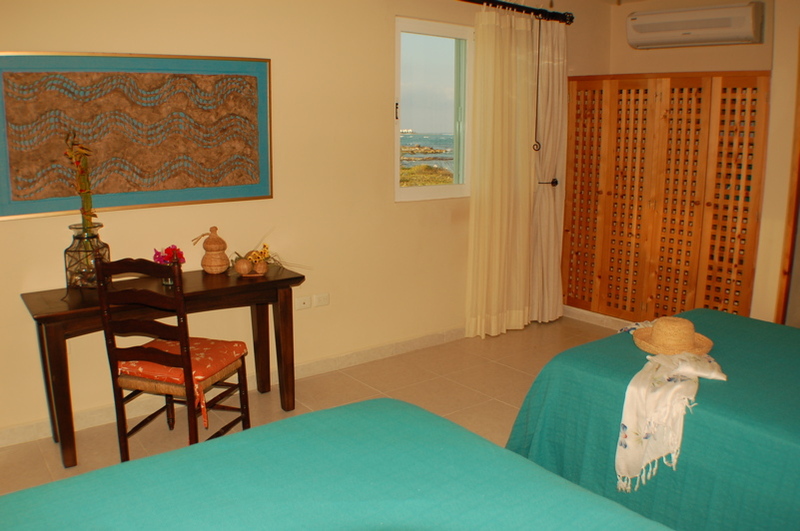 The roomy second guest bedroom has 2 double beds and shares the same big balcony with spectacular ocean views. 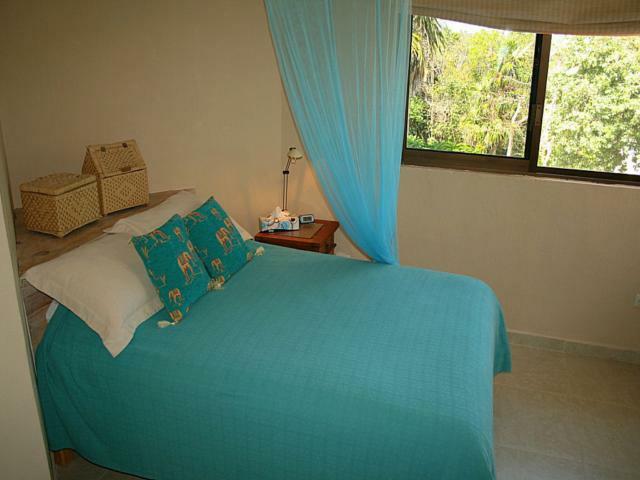 The spacious third guest bedroom also has two double size beds and amazing jungle views. 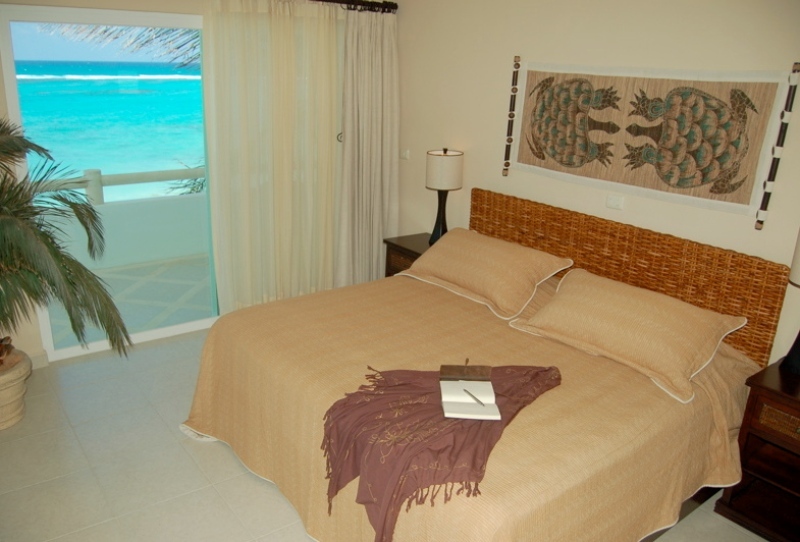 The Guest Level offers an additional 3 bedrooms on the south wing of the second floor and can accommodate up to 6 people. 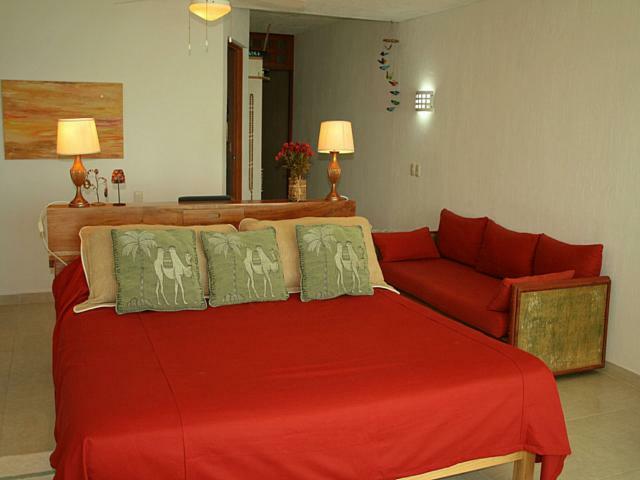 There is a large master bedroom with balcony and a very large bathroom with a king size bed. 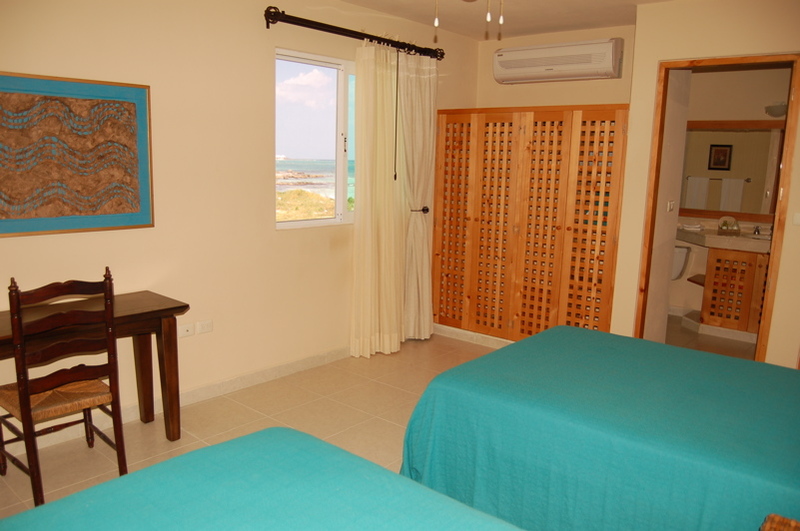 The first guest bedroom is ocean view and have a king size that can be converted in 2 twins and the second guest bedrooms with garden view have double bed and private bathroom. 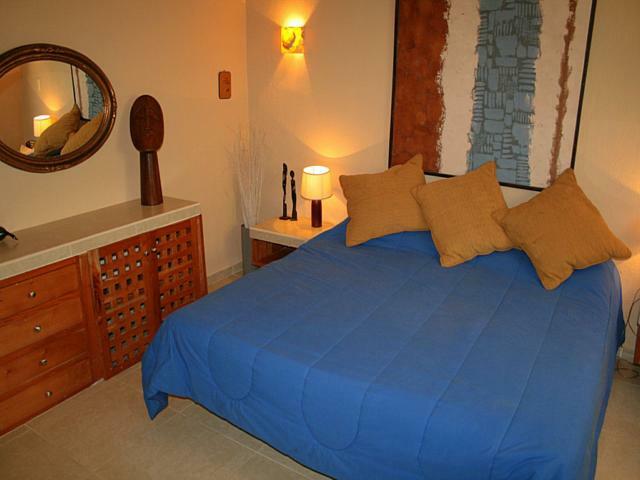 The crisp, clean feeling of this tastefully decorated villa, with the use of natural color and texture throughout, highlights its furnishings and perfectly appointed artwork. 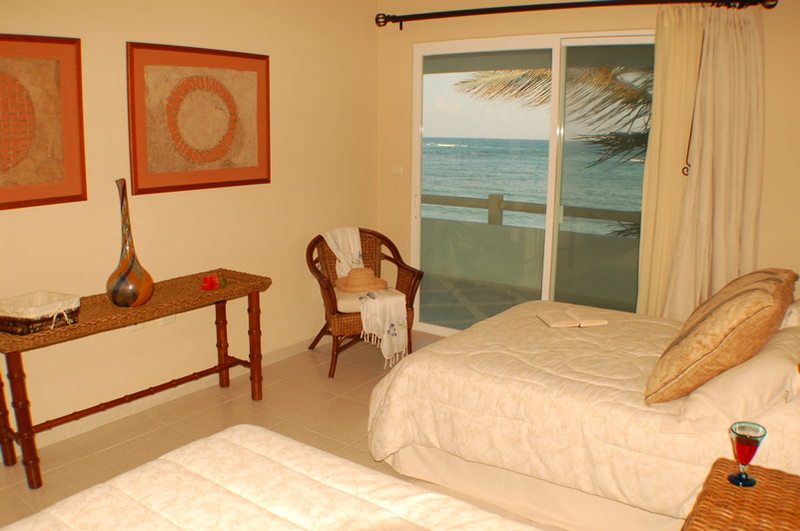 Enveloped in its own luxuriously soothing atmosphere, Villa Turquesa invites you to experience a vacation in paradise. All the services were excellent thank you for everything! Loved our stay. House was beyond expectations, as was the service that Jorge the manager gave us. He goes above and beyond to make the trip a once in a lifetime(that we hope to repeat soon). We stayed at Villa Turquesa for 10 days, 3 generations and 14 people! Everyone was very comfortable, and never felt crowded at all. 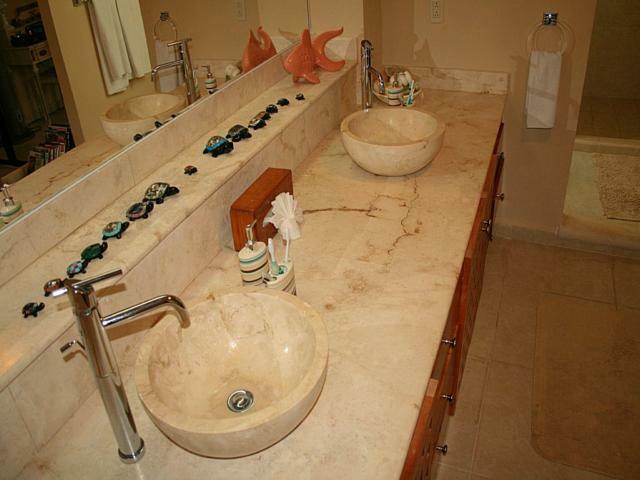 This was our first vacation rental and we were surprised that it was far above our expectations as the pictures don't do this property justice. 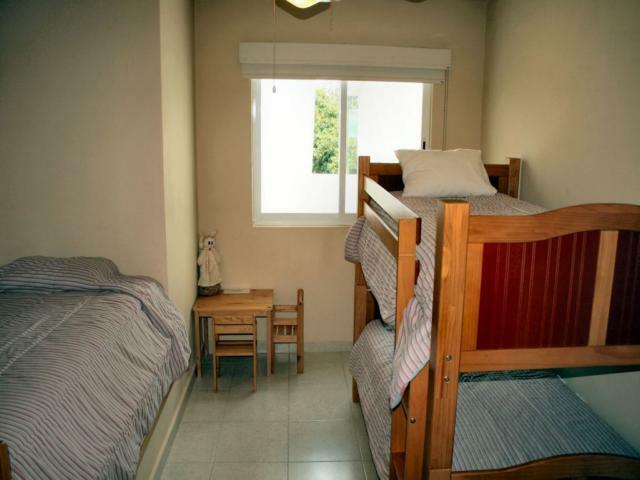 The Kitchen is very well stocked with dishes and cooking utensils, a full fridge and an upright freezer, gas stove with oven, and all small appliances you might want, the only thing missing is a dishwasher. 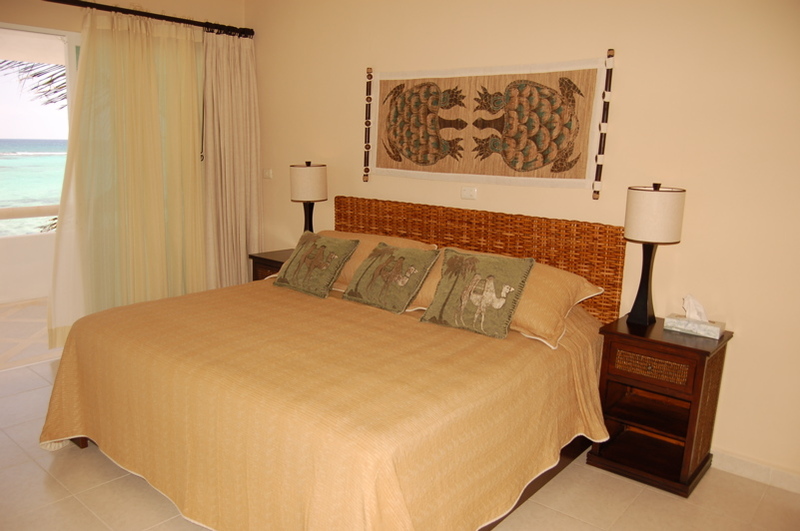 The bedrooms are large and comfortable, all with an ensuite bathroom. 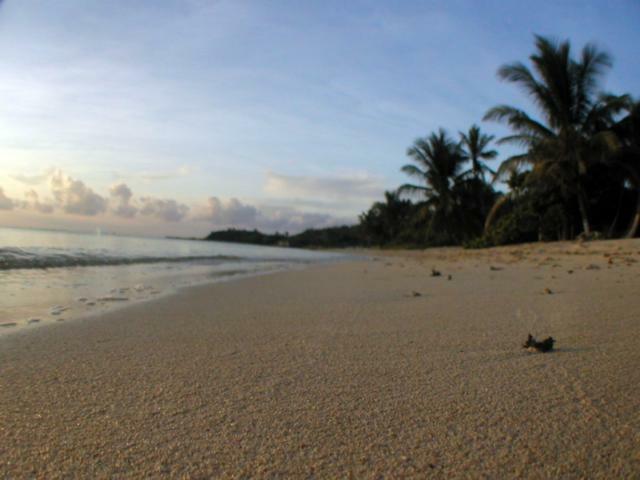 The view from the patio is beautiful and you are steps from some of the best snorkeling ever, the entrance is rocky but you can walk to a sandy area to enter if you like. We were greeted by Jorge who was great for info on everything we might want or need, he arranged fishing trips and a golf day, and helped with everything from heat rash to transportation, he also cooked for us 2 nights which was terrific and less expensive than eating in a restaurant. 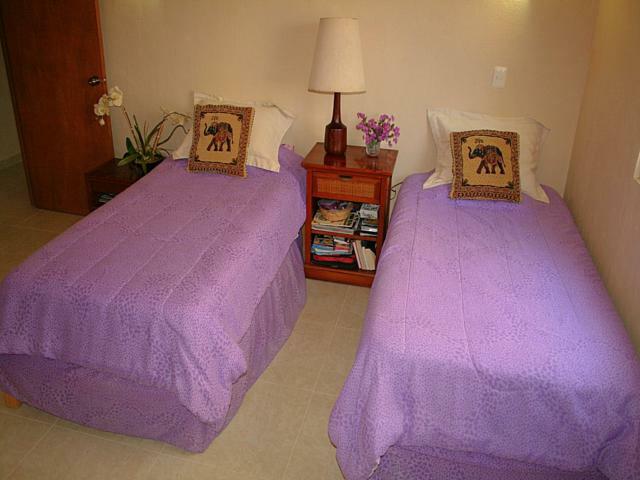 Olga and Rosy were our housekeepers and managed to keep everything spotless with 14 people on the go. Carlos was the gardener and he cleaned the pool daily and brought us fresh coconuts. The pool was fun and refreshing. We used the BBQ often and it worked great for cooking for the group. The kayaks were used every day.The villa is not within walking distance to restaurants or shopping so we would recommend a rental car as driving in this area is very easy, taxis are easy to get but are expensive and can only hold 4 people. Collectivo buses on the highway were used to go to Playa del Carmen, Xcaret and a few restaurants. The security on site was very friendly and helpful to call taxis. We can't wait to return and visit with our new friends at Villa Turquesa who helped make this trip so special. The villa was in a beautiful location. 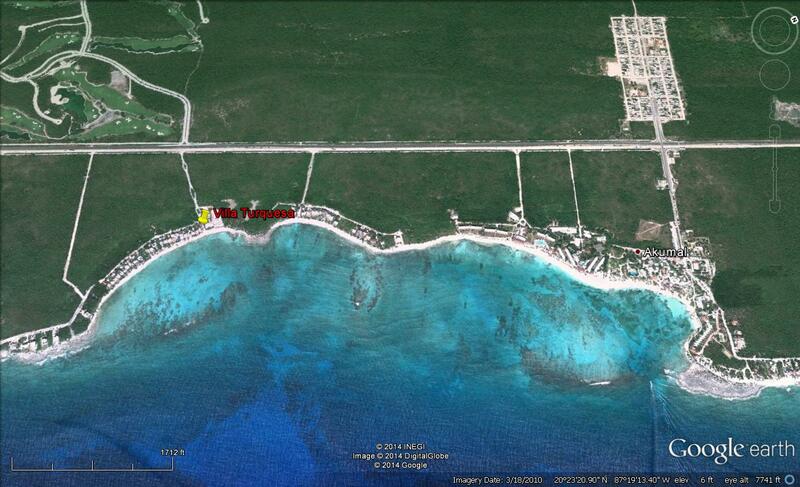 The beach was a mix of rock and sand but the reef was close by. The swimming pool was cool but clean and convenient. Staff was friendly. Gardner was particularly helpful. Area places to visit were great. 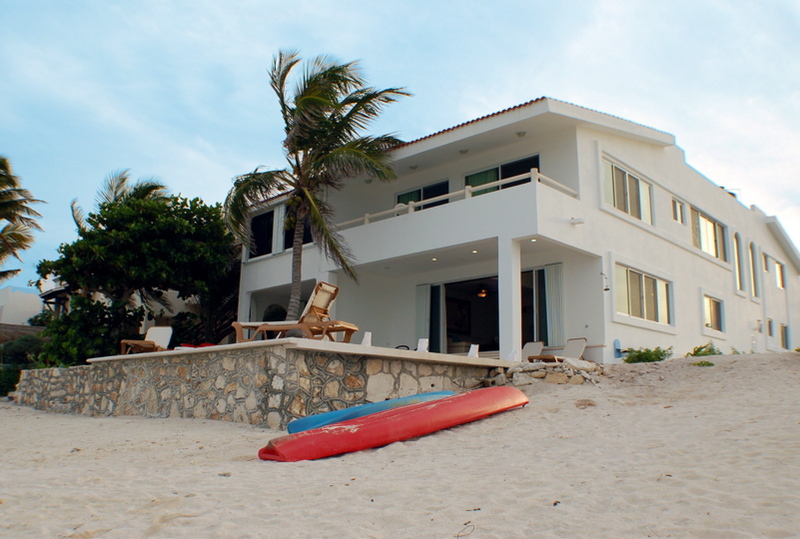 Our group of 10 fully enjoyed Claudia's hospitality and cannot wait to return to Mexico! Your home is beautiful! You have a beautiful home! The atmosphere provided a beautiful backdrop for a fantastic vacation! The house was more than we could have hoped for, and the service was excellent. Hopefully, we will get to visit you again! Thanks for everything, it was wonderful. 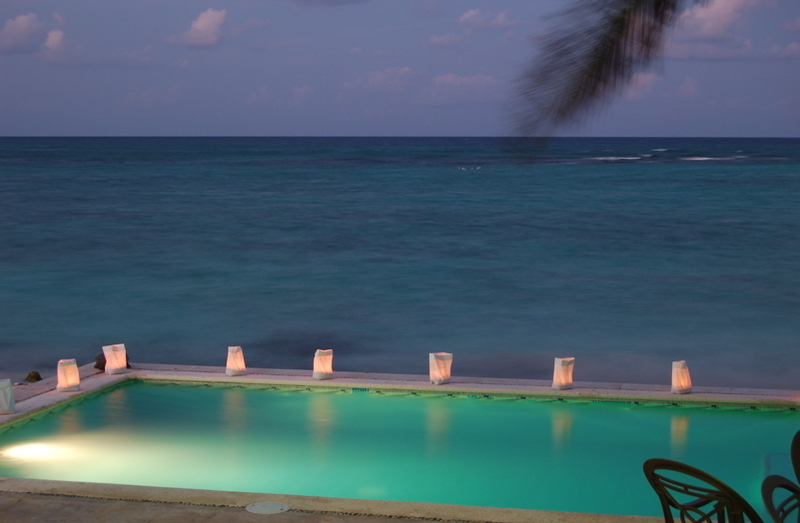 Our stay at Villa Turquesa was fabulous! A beautiful setting to have all of our family members celebrate our "big birthdays" Our children and grandchildren loved the beach, pool, snorkeling, hidden world, fishing, glass bottom boating and Dolphin riding. A marvelous place - we hope to return. Claudia and Isabel were so helpful.We thank you! Erika was a big help with the cooking. Love and a Happy 2008 to you. 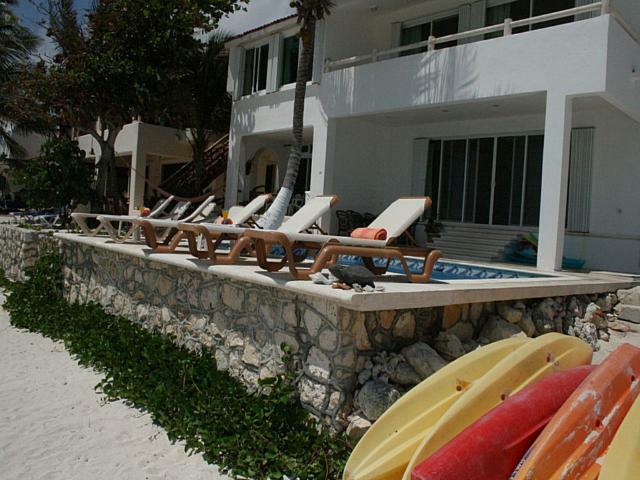 Our stay at the Villa Turquesa was simply perfect, thank you so much for "exceeding expectations" for organizing my niece 7th birthday party - everyone was speechless - our family of 12 was so comfortable, everyone enjoyed the pool, the kayaks, the snorkeling, the beach toys and your recommendation. 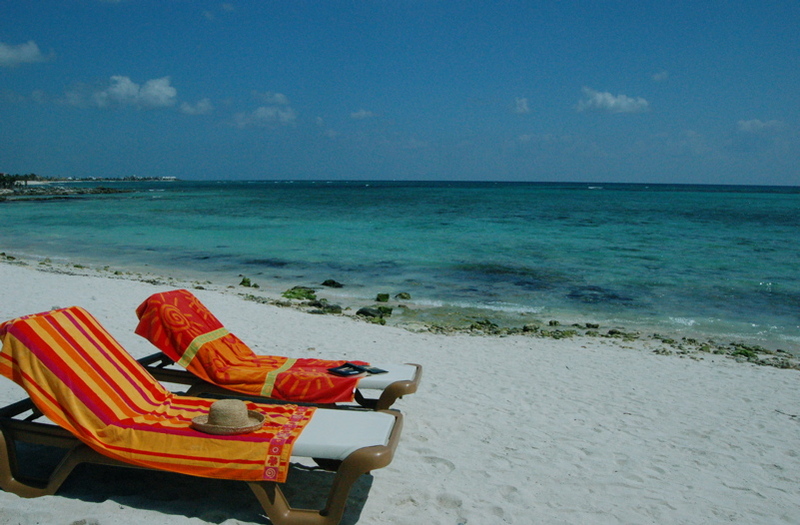 Our new year in Akumal was just a great start for 2008. We are going back to the snow - a little sad to leave but we will all take with us fun memories. Thank you for the wonderful time we were able to have at your lovely house. We loved everything about it. We could not have a better time! You, Erika and Ana helped us with everything we needed so we could just enjoy ourselves. It is a vacation we will never forget. Nos vemos pronto! Thank you for the most amazing vacation - our families had the best time - the home is beautiful and everything was so fun and relaxing! We will miss this place but hopefully be back again in the near future! 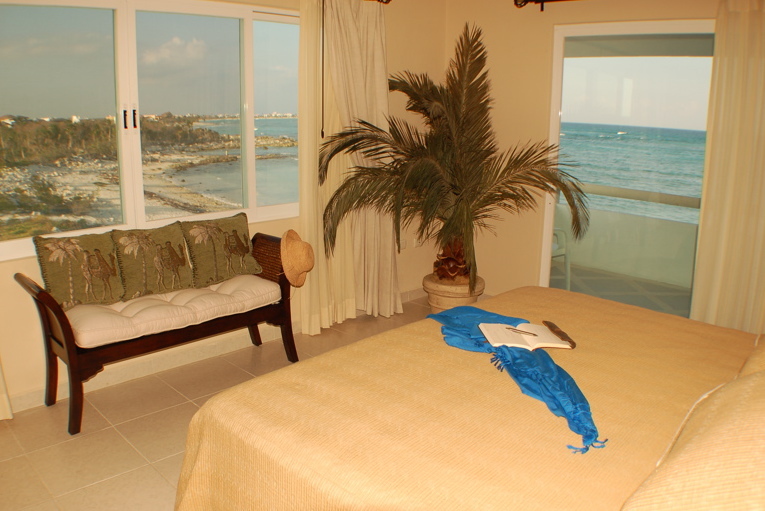 Villa Turquesa, those two words will live on in my mind for years to come.How wonderful to wake each morning to the rising sun over the sea. Erika's cooking was a treat, fish, fun, fish. The spiritual calmness envelopes you here. May all who enter.Enjoy! 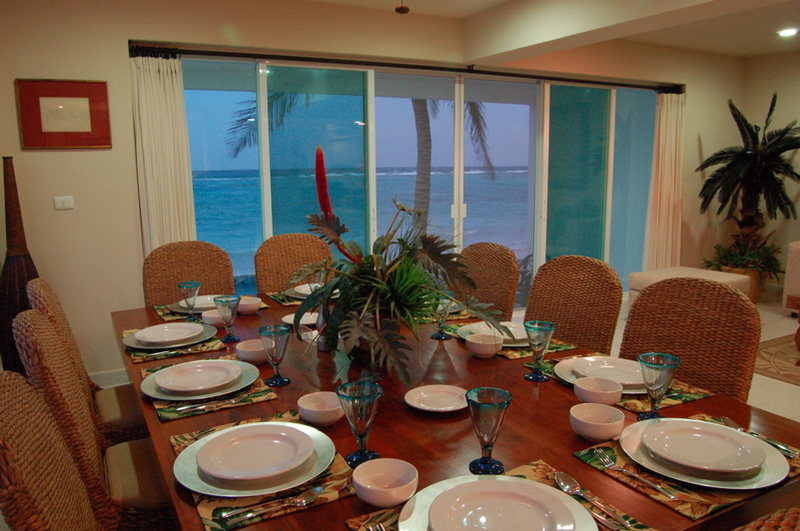 We thoroughly enjoyed Villa Turquesa!Erika is awesome, very friendly and a great cook!We had 5 families here from baby to grandparents!The beach is clean and beautiful!The patio set a great stage for our nightly "shows" hosted by the children! We visited Tulum, Coba and Chichen Itza all were awesome!Thanks to the staff of Akumal Villas for making the reservations easy and thanks to Monica for assisting with other details to make our vacation comfortable!Thank you for sharing your beautiful home with our family.Our memories will be chased forever! We had a wonderful time having a family reunion with 26 of us!! 15 kids who had a ton of fun snorkeling, building sand castles, swimming, playing card games and just enjoying spending time in the hot sun together!We had a fantastic day at Hidden Worlds, what a fun place! !We had some lovely meals in Akumal, loved seeing so many sea turtles and all the amazing fish in the reefs - truly a snorkeling paradise.Saw barracuda shark, rays as well!Kayaking was fun too!Lots of margaritas were had, lots of memories made and lots of skin was tanned!It was an amazing time together and the accommodations were great!Having a more real Mexican experience was awesome!Thanks.